That night I went to bed feeling unusually anxious. I lay there, as I often did last thing at night, feeling the fluttering movements of the baby inside me, and loving the swell that his presence made to my tummy. I woke sometime around 4am with strong cramping and tried to relax. The cramps came in intense waves. Suddenly there was a great pop and water flooded out of me. All I could think was, “No, no, no!” I ran to the bathroom and it continued to stream out like nothing I had ever experienced before. It seemed never-ending and drenched my nightdress, towel, and floor. With a sense of disbelief I woke Jaimie. He was disorientated. We whispered in the bathroom, trying not to disturb the children, at first muddled about what to do. Dreams of a serene home birth flew out the open window. I knew we needed to rush to hospital, a good one. Jaimie rang Val (4:27am) and she suggested that we meet her at the Brighton Hospital as soon as we could organise care for the children. Jaimie rang Julia (4:49am) and she came straight away. I dosed myself alternately with arnica and aconite. By this time both Marcus and Cara were awake. Jaimie gathered things to bring with us: my lenses things, a toothbrush, spare pyjamas, pants, sanitary pads, fruit purees, energy bars, my handbag, his mobile. I sat on the edge of the bath, regular and intense waves washing through me. 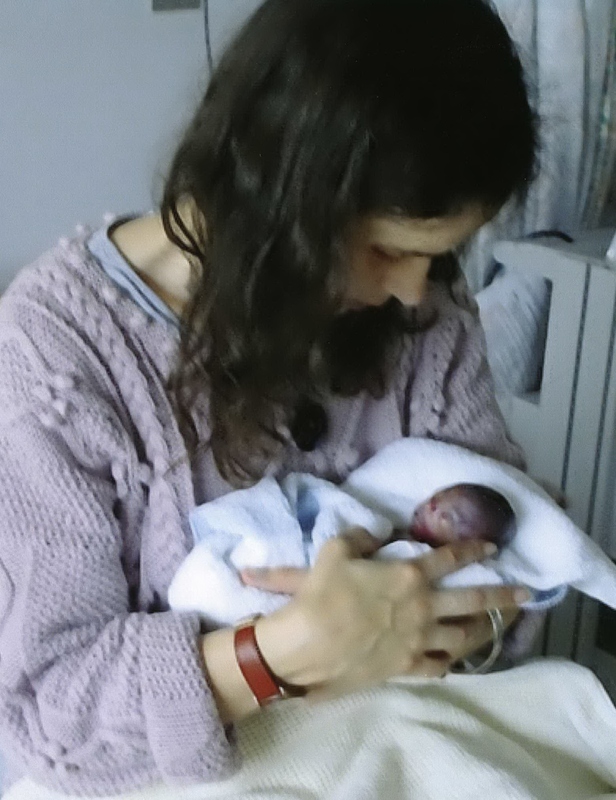 At this point I think we were both hoping that hospital would be a place I would be staying for a while, resting and on antibiotics, with drugs to assist the baby’s swift development, while we tried to keep the baby inside me for as long as possible. He brought me clean pyjamas. I put on the top, a cotton jersey, and wrapped myself in Marcus’s bath towel. I felt so cold; Jaimie brought me the kiwi blanket and my crocs. He rang Val just as we were leaving the house (5:11am). Jaimie settled me into his citroen and took off at speed. I was unsure how I would manage my contractions in the unsettling environment of a moving car. I closed my eyes and went in; willing the contractions to subside. I totally trusted Jaimie to drive me there swiftly and safely. I went deep inside and found the movement of the car to be soothing and it was when he had to stop that I felt myself distracted. Later Jaimie told me that twice he narrowly missed deer that leaped across the road; I have vague memories of sudden halts. Once parked outside the Accident and Emergency department of the hospital Jaimie went in search of a wheelchair. As he helped me out of the car we both saw that my towel and his car seat were drenched in blood. I began to accept that I was in labour and all was not well. The dodgy wheel on the wheelchair made it impossible to push straight and Jaimie became stressed, unsure where to go and unable to direct the chair. Still with my eyes closed, needing to keep an inner calm, I implored him not to express his distress, to take his time, and trust that he could deliver me safely to Val and the delivery ward. He discovered that he could drag the chair behind him more successfully and, with a few wrong turns where signs were absent or unclear and with no-one in sight to direct him, we arrived at the locked door of the maternity ward. He buzzed and a midwife admitted us. All I could say was, “Where is Val Taylor?” Val appeared and we were led to a private room where I was at first reluctant to climb out of the wheelchair. I found a way of maintaining my inner focus in the car, then in the chair, and I resisted change or need for activity. I stood and leant on the bed. Val found me a foam mat and a birthing ball, so that I could squat on the floor. The hospital midwife came in and took over. She kept talking to me, wanting to examine me, asking if we wanted a resuscitation team to be mustered. I only wanted to communicate with Val and Jaimie and then not when in the midst of a contraction which was almost continuously now. I refused examination, confirmed with Val that I was clearly in labour and there was no question trying to hold back, and turned to Jaimie to consult him over resuscitation. I have always maintained that I have not needed to risk any harmful effects of scans as I would trust nature’s selection. Truly nonviable babies would miscarry and if a baby survived to term, albeit it with abnormalities, we would accept whoever they were. This did not mean that this prospect did not fill me with dread but I knew that I would not abort a baby that was managing to survive. However, I also have strongly held beliefs that we do not respect nature enough to allow a struggling new-born to go. I feel that we use our ever-more developed technology to keep babies alive that are too compromised, putting them through all kinds of suffering in the process. When expressing these views I have also admitted that I did not know whether I could follow through, if ever I was faced with the decision myself. I was bleeding copiously which helped me to realise that things were definitely awry. No, I would not want to resuscitate. I went back inside, deep inside, going towards our baby to help bring him back with me into the world, as I have done for all my babies. This was not without some ambivalence. I knew this was too early for him to have much chance of survival out of my womb. I knew that all my bleeding was not a good sign. A couple more contractions and with no need to push, I silently breathed him into the world. I held him in my cupped hands. He was tiny. He was bruised. He was beautiful. He opened his little mouth. Was this his first, and last, breath? He was not strong enough to survive. I held him and Jaimie and I gazed upon his dear little, fragile little, perfect little body. We examined him. Little face, dear little mouth, the family up-turned nose, eyes tightly closed, eyebrows, little ears, little body, warm but limp, little fingers, tiny fingernails, little feet, toes. Our baby. Here in my hands but gone. We were left in peace to be with him. It was timeless. We looked and looked. Held each other. I think Jaimie cried. The hospital midwife returned eager that I deliver the placenta, offering an injection of syntometrine, which I declined. She told me that I had given birth at 6:40am and stressed that they could only allow me half an hour after delivery and that time had long passed. She left to check with the consultant how long she could safely leave me. Val gave Jaimie the surgical scissors to cut the baby’s cord and Jaimie took our baby in his hands for the first time. Val cleared away the blood-soaked hospital towels, kiwi blanket, Marcus’s towel. I kept apologising for my mess. The contractions had ceased. I felt that my body had closed as I closed in on myself. It felt hopeless to try and deliver the placenta; I felt sure that my cervix was clamped tightly shut. Val whispered words of encouragement into my ear. The hospital midwife returned to say the consultant had granted me an hour which left me only ten minutes more to deliver the placenta by myself. I set my mind and body to the task. I knew that I was going to have to force the placenta out and I pushed with all my might. Over and over again. I managed to push some of it out but no matter how much Val teased at my cervix, the placenta was still partly lodged inside me. She encouraged me to cough, push and cough. I tensed my body and pushed with all my might and out slipped the placenta, and a whole lot more blood. I felt a sudden huge and final loss. That was it. Baby gone. Placenta gone. I was left empty. No baby in my arms, suckling at my breast. My heart broke and I sobbed while Jaimie returned our baby to me and held me close. We cried together. Val helped me climb up from the floor onto the bed and made me comfortable. More blood. I cradled our baby in my arms while Jaimie encircled me. There were more tears. There was also a strange, detached calm. I was able to feel grateful that we had been spared a fight for life and that Theo had not suffered or had to face a difficult life. There was a relief on our own behalves too, not to have had to come to terms with life with a ‘special child’. I reflected on how Theo’s movements inside me had always felt weaker than I was used to. Memory of the ‘loud pop’ of my waters breaking kept returning to me, the shocking start, so strong and clear. It was so reassuring to be told that Theo was how he was right from the start, nothing to do with my poor health during the pregnancy, and not in any way our fault. There was also a strange and shameful lifting at the release from the anticipated stresses of living with a new-born baby – suddenly life seemed simpler again. Before the grief proper took hold, I was able to think dispassionately of these ‘good things’. I began to have contractions again and each time the pads were flooded with blood and clots. The sequence of events becomes hazy from here. There was a change of hospital midwife. Ali was lovely; respectful of us and of Val’s special importance to us. Someone brought a digital camera so that we could take photographs of our precious little boy. A bereavement counselor came a few times offering her support, then and in the weeks to come. She asked if we would like her to contact the hospital chaplain for a blessing. She brought a pack of information from The Annabel Harwood Trust produced by SANDS (Stillborn and Neonatal Death Society). She asked if we would like to take hand and foot prints. I think there may have talk of a holistic funeral director. Ali brought tea and toast for Jaimie and Val. The consultant obstetrician (and clinical director of pediatrics, obstetrics and gynecology), Des Holden, and his registrar came to discuss the risks of a probably retained placenta and to recommend surgery options. For some reason Jaimie was not there; perhaps he was having to move the car. I felt inclined to go home, treat myself with homeopathy and acupuncture, and be alert to the first signs of infection and septicemia. He encouraged me to consider the rest of my family. He asked if we wanted a post mortem on our baby for which I had a clear and definite no. I continued to drench the pads with blood. The hospital chaplain arrived, but I remember there seemed to be lots else happening at the time and it felt overwhelming. The chaplain began by asking about our spiritual beliefs and I struggled to answer. He realised we did not fit neatly into any spiritual house and said that what he had to offer us was a Christian blessing. We gratefully accepted. He then asked if we had a name for our baby. Jaimie asked what I thought of Cory, I replied that I liked Theo, to which he benevolently agreed. Val informed us that Theo meant ‘Gift from God’. Nothing could be more perfect for our little boy. The chaplain handed us an order of ceremony sheet. The simple ceremony was just right. I wept and wept. Jaimie and Val were also moved to tears. The chaplain left us with a blessing certificate and offered us the opportunity of having Theo’s name registered in the book of remembrance in the hospital chapel. I was still experiencing contractions and at each one huge surges of blood and clots soaked the pads which had to be changed. It was beginning to look like it might not be such a good idea to go home and allow nature to take its course. I had a growing secret feeling that I might like to join Theo. The consultant anesthetist was called to discuss our options, and after having decided with Val that I would want a general anesthetic should I need to have the retained placenta removed, the anesthetist was strongly in favour of a spinal injection which would leave me conscious. We discussed the risks at length and when I ascertained that the statistically safest option was the spinal I made that choice not for myself, but for my family. I ascertained that I could have the top consultant Des operate and the consultant anesthetist and that Val and Ali would stay with me and request the theatre staff to behave as if I were fully conscious. In any case, we still had not decided to go ahead. Part of me was drifting away, none of it seemed relevant. Someone came to insert a stent to take blood samples. I knew that I was losing a lot of blood, more than anyone was seeing. I was fading and seeing stars but I kept it to myself. Secretly I was still with Theo. In labour I had gone to him to bring him into this physical world and now that he was gone I wanted to travel that journey with him too. It was such a strong pull. I wanted to stay with my baby, see him safely to wherever he was going now. I wanted to die too. I felt myself going. It felt wonderful. Blissful. I was with Theo and we were both heading somewhere that felt so harmonious. We were one, Theo and I. Everything was one. We were expanding into everything. At the same time our delivery suite became an emergency room. I passed out, eyes wide open. Jaimie said that the room filled with surgeons, anesthetists, midwifes. Pushing furniture aside, my bed was wheeled into the operating theatre next door. Jaimie was left, holding Theo, thinking that he might lose me too. Although I have no awareness of any of his happening, I am also certain that I had already made my choice not to leave with Theo, but to return to my dear husband and precious children. And the return was equally blissful and right feeling. Meanwhile the operating theatre was still in emergency mode. Gas and air. Injections into the stent. Breathing tube. Ventilator. No time to find the consultant, his registrar Raz had to operate. My blood pressure dropped to eighty over forty. What had been predicted to be a ten minute operation lasted an hour. Val later reassured me that Raz had been respectful and efficient. As promised, both Val and Ali remained with me throughout. It transpired that a retained placenta was only a part of the problem. I had been bleeding copiously, huge blood clots blocked my cervix, and over a litre of blood was held inside me behind them. I had lost half my blood volume and my haemoglobin count had plummeted to 6.2. Back in the room where I delivered Theo, I came around so gradually. At first I had no awareness of where I was or that anything had happened. I could not quite get a sense of being me – separate and present. Then there was Jaimie beside me but I couldn’t communicate with him. I was filled with such love for him. And for Theo, who was placed in the crook of my arm. I think I had a mask over my face. Apparently, Val had been holding my hand and informing me of all that was going on for some time, for which I had managed to respond by moving my finger, but I have no recollection of this. My first memory is of Jaimie beside me. I was filled with a powerful desire to convey my most important truths to him, but I could barely whisper incomplete sentences. I cannot remember anything of what I said now, but stiltedly I think I told him how much I loved him, how I wanted to live that love, get over my childish self and give of myself to our union, of a how important his whole-hearted presence was in my life, how I did not want him to disappear back into work and stress, how precious the children were, how much I wanted to hold onto the gifts of these experiences. Val had to go and do something for another of her clients and offered to go and pick up Marcus and bring him back to the hospital on her way back. This so felt like the right thing to do for Marcus. So much else went on around me. The familiar names were confusing: The bereavement counselor, Karen, came and went several times. I did not like the disposition of my recovery midwife, Heide. There was talk of a funeral director, an eco-friendly one called Cara. She was going to lend us an air conditioning unit to help keep Theo cool at home as I was adamantly opposed to the idea of him going to her cold chambers. Once I had received both units of blood (although Val thought they should have given me twice as much) they finished with a saline solution and I was unhooked. At some point my bed was wheeled from the recovery room back into room 38 where I had delivered Theo. I wanted to look as well as possible for Marcus so Ally helped me to wash and Mum found me some clean pyjamas. Now that Mum was with me Jaimie felt able to go and move the car, five hours after the parking meter would have expired, and he coordinated with Cara to meet her at the car to receive the air con unit. Jaimie returned with a parking ticket. Then I remember waiting, waiting, waiting for Marcus to arrive. He remembers the same, waiting impatiently for Val to come and collect him. Anna insisted on sending food for everyone which was gratefully received and eaten around me while all I wanted to do was leave for home. I did not realise that everyone was actually waiting to see if I would rally sufficiently for this to be wise. How I handled Marcus’s arrival felt so delicate. I wrapped Theo and tucked him out of sight so that it could be about him and me to begin with. I held him to me. Marcus was clearly deeply upset and we cried together. Then he peered over at Theo. He was not full of questions as I had expected, but full of tears. I was full of love for him and found myself telling him how much I loved him, whatever he does, however he behaves, I always love him no matter what. Love poured out of me into my first born and I said things about how special he is that I should say more often. I described to him his singular qualities and reminded him that his drive for perfection was totally unnecessary. The hospital staff were so supportive. Although I doubt my resolutely stated intention to bring Theo home with us was a common one, it was accepted and respected and somehow behind the scenes the paperwork was done to release Theo’s body. They lent us a digital camera and returned with the photographs developed. They brought Jaimie and Val numerous trays of tea and toast. Later on I discovered that while I had been out of it they had helped to take Theo’s hand and foot prints and weighed him in at ten ounces. They wrote Jaimie a letter to send to the parking ticket people. They gave us packs of information to refer to later, none of which we would be able to take in at the time. There is a beautifully presented pack from the Annabel Harwood Trust full of leaflets, books and information from SANDS (Stillbirth and Neonatal Death Society). I notice I have really minded when I have overheard people calling Theo a miscarriage. It is possible he was alive, oh so briefly, in which case he was a neonatal death; otherwise he probably died during the labour and was stillborn. Ali the midwife never imagined that I would be strong enough to leave that night and was reluctant to remove the cannula as she did not believe I would be leaving, but I was determined. I had three children that I needed to return to, no matter what. I was so enormously grateful to Julia. I absolutely trusted her to care for my three like they were her own, leaving me free to attend completely to myself and Jaimie and Theo. However, it seemed crucially important to sleep together and wake up together. Val was aware of my intention and my determination and set me three tasks to assure her of my roadworthiness. I was to pee more than 300ml. I was to walk to the toilet unaided (I don’t think she expected me to be able to achieve this one). And I was to eat, which she allowed me to forgo. Finally, everything was gathered and we were ready to leave. It was late; past ten perhaps. As we left Val said a farewell to the room where Theo had been born. I was grateful to her for this, to pause and remember his birth, as so much since then had been about his death. Ali steered us away from the public lift full of people and took us down in the staff lifts and led us out to where Jaimie was waiting with the car. Val made sure I was safely installed and popped a stafasagria remedy in my mouth. Leaving the premises was another letting go, another time for shedding tears. I sat in the back of the car with Marcus, holding hands, and cradling Theo and kept my eyes closed the entire journey. When we arrived home, I walked in and up the stairs and got straight into bed with my baby, and all my babies.